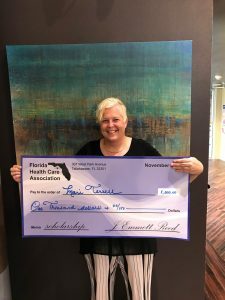 Mari-Kelly Terrell, an LPN at Fletcher Health & Rehab Center of Tampa, is an August recipient of FHCA’s Bruce Taylor Scholarship. Mari-Kelly currently works as a Wound Care/Restorative Nurse for Fletcher Health & Rehab, and is attending Excelsior College to earn an Associate’s Degree in Nursing. 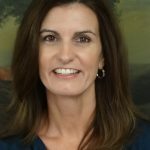 She upholds a high-standard for the work she performs, nurturing and advocating for her patients to the best of her ability. Mari-Kelly’s work ethic is prevalent in the certifications she has earned in her long term care career of 31 years: Wound Care Certification, MDS Certification, Legal Documentation, and FHCA’s Train-the-Trainer, among others. The Bruce Taylor Scholarship Program assists the best and brightest among FHCA member center nursing staff to assist them with achieving a higher level of education in a field related to long term care nursing. The scholarship was named after Bruce Taylor, FHCA President from 1980-82, who was instrumental in moving the association to Tallahassee and negotiated on the Gainesville Plan, Florida’s first-ever Medicaid reimbursement plan for nursing centers. A generous contribution from Ross Laboratories established the fund, with a significant donation made by the family of the late Bruce Taylor to perpetuate scholarship awards. The next deadline to apply for scholarships through the Florida Health Care Education and Development Foundation is November 30, 2018. Click here to learn more about the Bruce Taylor Scholarship and other opportunities.